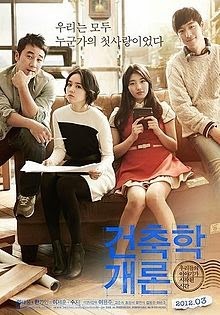 Architecture 101 (건축학개론) is a 2012 South Korean romance film written and directed by Lee Yong-joo. It tells of how two students who meet in an introductory architecture class sort of fall in love and how the reunion turns out 15 years later when the girls finds the guy (who is by now an architect) to get him to build her dream home. Seoul, the present day. Out of the blue, architect Lee Seung-min (Uhm Tae-woong) is approached by Yang Seo-yeon (Han Ga-in), whom he knew at college some 17 years ago, to design a new house for her on the site of her 30-year-old family home on Jeju island. Seung-min reluctantly agrees but can't come up with a design that pleases her. In the end, they decide to renovate and expand the existing house, and he and Seo-yeon spend a considerable amount of time together down in Jeju, to the growing annoyance of his fiancée Eun-chae (Go Joon-hee), with whom he is soon to be married and move to the US. As Seo-yeon cares for her dying father (Lee Seung-ho) and Seung-min learns more about what became of Seo-yeon in the intervening years, he recalls their initial meeting at college in the early 1990s. Seung-min and Seo-yeon (Lee Je-hoon and Suzy) had lived in the same neighborhood (Jeongneung-dong, Seoul) and attended the same architecture class. He remembers her liking rich student Jae-wook (Yoo Yeon-seok), his inability to declare his attraction to her, and the times being coached by his best friend, Nab-ddeuk (Jo Jung-suk) in how to get girls. Hoping to confess his feelings to her at the perfect timing, Seung-min asks Seo-yeon to meet him at the abandoned house they frequent, on the first day that it snows that coming winter. But one night he catches Jae-wook and a drunk Seo-yeon entering her house together. Fearing the worst, he ends his friendship with Seo-yeon due to his pain of believing she had chosen Jae-wook. The first day of snow arrives, and Seo-yeon is left waiting in the abandoned house alone. Heartbroken, she leaves behind her portable CD player with a CD of her favorite artist. Seo-yeon in the present day receives that very same CD player and CD from Seung-min, meaning that he actually went to the house later and remembered their promise. But despite the bitter-sweetness of their first love, in the end, Seung-min still chooses his fiancee Eun-chae and flies with her to America, while Seo-yeon sits in the house he built for her, listening to the CD. The movie gave off the nostalgic feeling, especially when it came to the flashbacks (no handphones, bulky computers and everything analog!) of both Lee Seung-min and Yang Seo-yeon when they were younger. There were heartwarming sweet moments when the both of them interacted and got close to each other, as well as funny moment when the naïve Seung-min (guy) thinks the world of Seo-yeon (girl) and stresses on how to confess to her. Seo-yeon, on the other hand, starts off with a crush on Seung-min’s classmate (and the reason for her being in the architecture class) and ends up having feelings that were never realized for Seung-min. It’s a first love not meant to be and honestly speaking the ending was disappointing. The situation resulted because both parties were timid and made their own assumptions, leading to lingering regrets. When the two meet at the start of the movie, and as the movie progressed it was evident that they were clearly starting to get closer again (with flashbacks of their past being shown). What could have been a sweet romance ended up being a little pathetic (in my opinion): it was suspended between a crush and first love. It could have been a memorable first love, but due to the guy’s naivety, timidity and low self-esteem he never got round to confessing to the girl. He simply ignored her and brushed her off, which of course left her confused and hurt, especially when she was just about opening up to him. Due to a misunderstanding that was not resolved, it drove two people apart with lingering regrets. They say youth is foolish, but this is ridiculous. He should have just told her and gotten rejected (since he was expecting that outcome but he never did anything), and/or the girl should have just asked/confessed. Either way one of them should have done something to end it on a known note. It doesn’t have to be on a good note, but as long as they understood why. If the guy went back to the house when it first snowed and saw the CD player and CD left for him, he should have done something about it than. Instead he chooses to return it to her years later when they meet again to ‘conclude’ their romance (What romance? What first love?). Alternatively, if they were ‘broken up’ even before they even started, they should have just moved on with their lives. The girl shouldn’t have gone to find the guy with hopes that they would get together. The guy on the other hand seemed to have moved on pretty well, getting a girlfriend and even in the process of getting married. While it may seem admirable that he chose his fiancée, it doesn’t look like they have any chemistry. For the most part, it seemed like he was just going along with the flow and everything was initiated by the fiancée: from the wedding to the move to America, even getting her parents to sponsor their new home. There were moments of frailty when the guy shows his (overly?) concern for the girl, that even the fiancée become insecure. If a person has decided and there is no turning back, in real life certain boundaries have to be drawn. While sweet and fuzzy at some points and funny at others, with an ending that seems concluded by both parties (but who knows? With affairs, reminiscences, and whatnots anything is possible really), it still seems unfinished. Even with melodramas and what not, there was no bittersweet feelings for this movie. It was sweet and bitter, but nothing conclusive and a little too ambiguous for my liking.